Anti-Icky-Poo costs the same but works far better than the best selling national brand. If other products have failed you, Anti-Icky-Poo is here to help! Anti-Icky-Poo is 100% performance and satisfaction guaranteed. Our product works safely on every material from silk to concrete. One customer successfully used Anti-Icky Poo on her Louis Vuitton hand bag. Use Anti-Icky-Poo first and after the odor is gone, clean the area as you see fit. The directions are simple. Just spray and walk away! Anti-Icky-Poo will do the hard work for you. "I do not endorse or recommend many products, but I am happy to, and very comfortable endorsing Anti-Icky-Poo. 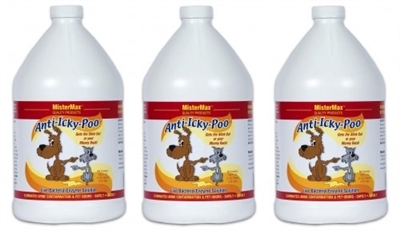 All of the Anti-Icky-Poo products deliver the highly effective results that are advertised." said Dr. Darcie Heyes, DVM, Hospital Director of the "Cat Doctor", with offices in Ventura, Thousand Oaks and Lawndale, California www.TheCatDoctorOnline.com. With a shelf life of more than two years, you'll always have AIP on hand and your odor issues will always be resolved when you buy the two galloon set. Anti-Icky-Poo is eco-friendly and environmentally safe. Need your Anti-Icky-Poo fast? We ship from 4 locations and 84% of our shipments are delivered in 3 days. No other distributor can compare to Anti-Icky-Poo.com in price or delivery speed. A friend turned me on to Ant-Icky-Poo, and I'm forever grateful! It's fabulous for those gross messes our dear felines make; urine, barf, poo. Ugh. PLUS, it's wonderful for soaking my hubby's sweaty gym clothes. We'll always have a gallon by the laundry for making the best of an "icky" situation!